During my 86th Birthday celebration dinner a few night ago with my close friends and relatives, many of them asked me to write my memoir of my illustrious life. They said that the book would be a very useful guideline for people to live a happy and useful life to help people. About 6 years ago, I wrote and published my book namely “Malaysia: Road Map for Vision 2020”. Tengku Razaleigh Hamzah, former Finance Minister wrote the Foreword, Dato Ambiga Sreenevasan, Professor Glen Arnold, Dr Azly Rahman and Professor James Chin wrote their recommendations. I took more than 2 years to research and to complete the book. To make it a first-class publication, I had to spend Rm 10,000 to employ an expert to do the indexing at the end of the book. However, from my experience, I am not prepared to spend another 2 years of my limited life to write my memoir. However, I will write about my experience in equity investing. My purpose of writing this piece is to show mistake as well as my skill in picking stocks which should be helpful to all investors. In 1983 when China gave notice to the British Government to recover the sovereignty of Hong Kong, the Hang Send Index fell to below 600 points. Most of the stock holders sold their holdings because they were afraid the Chinese Communists would shut down the stock market and confiscate all their assets. During this crisis, I did not need any skill to pick stocks because there were so many under-priced stocks. All I need was bravery. As a founder of Mudajaya, Gamuda and IJM Corporation Bhd, I have been taking big risk as a contractor. I thought this crisis in Hong Kong was a fantastic opportunity to make money in the stock market. The first stock I bought was Hong Kong Realty and Trust Ltd (HKRT). Just before the crisis, the company sold one of their assets call “Willocks House” and its balance sheet showed it had $ 10 net cash per share which was selling at $ 13.60 per share. During the crisis, it was selling at $ 3.00. About 2 months later, when the Chinese Government announced that Hong Kong would be given another 50 years extension, immediately HKRT shot back to $13.60 per share. Wah! $ 3.00 to $ 13.60 is 450% – I was pleasantly surprised to make more than 450% within 2 months. 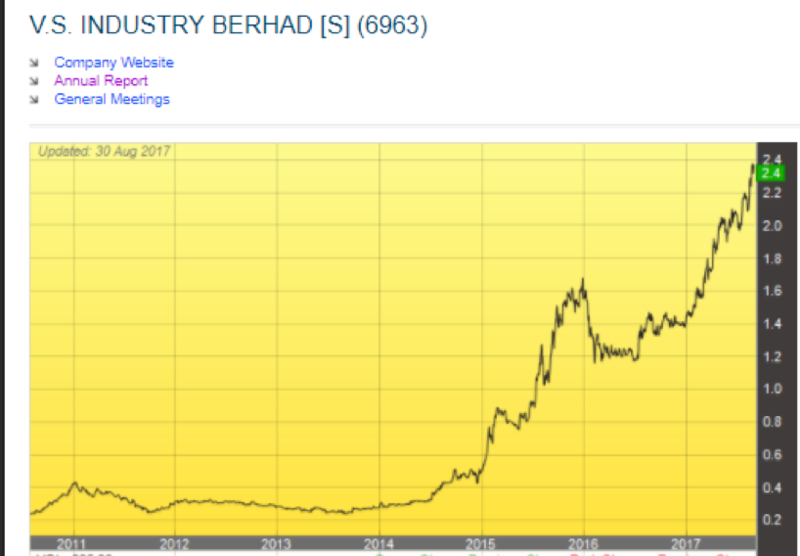 Why should I continue to seat on the Board of IJM Corp Bhd to earn a small sum worrying for thousands of shareholders? From then onwards, I became a full-time investor. Within 2 years, I made so much that I bought 46% of a HK stock Broking company called “Kaiser Stocks and Shares Co Ltd”. It was so easy to make money during the crisis. All I needed was bravery to buy during the cheap sale. I dared to buy when most people were so afraid. But it is not so easy to make money during normal circumstances. So, I started reading about the methods as practiced by Warren Buffett, Peter Lynch, William O’Neal and other gurus. All of them have one common investing signature- value investing. After having practiced value investing for a few years, I found a faster way to make money. Before I start to buy shares of any company, the company must report that it has been making increasing profit for 2 consecutive quarters and the price is selling below P/E 10. Before I tell you about my Rm 64 million disaster in buying too many Jaks with margin finance because I did not follow my golden rule, let me boast about my success. At one time, I was the 4th largest shareholder of Latitude Tree, 2nd largest shareholders of VS Industry and Lii Hen. 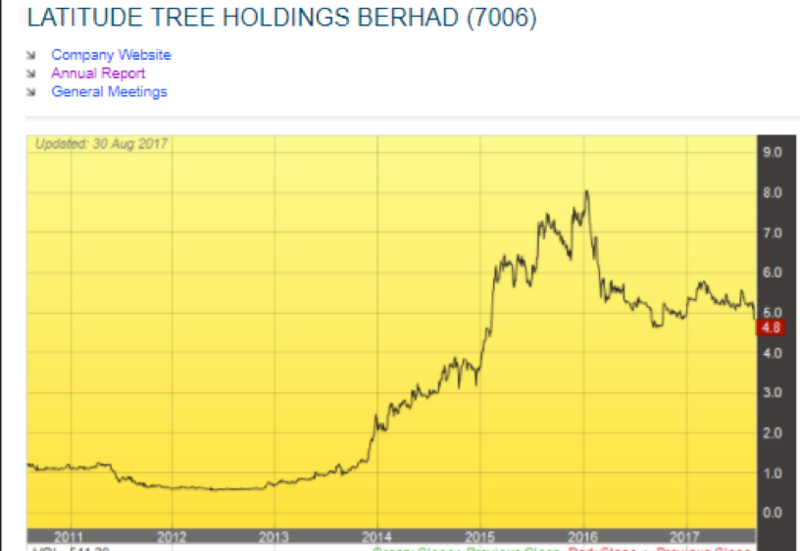 The above chart shows that Latitude Tree went up from Rm 1.00 to Rm 8.00, an increase of 800 % within 2.5 years. Its 2015 annual report showed that I was the 4th largest shareholder holding 6.32 million shares. On Dec 2018, I have posted my article namely “Jaks- My most expensive mistake” in which I shamefully admitted that I lost Rm 64 million. As a result, a few of my critics always doubted my honesty whenever I recommended any share. Even my close friends, were afraid that if they gave me a loan, I would not be able to return the money they lent me. However, I always believe I can make back some money with my skill in picking stocks. I must say that God works in a mysterious way to help me to make money so that I can help others. An inner voice told me to buy Carimin and Hibiscus WC a few weeks ago. Yesterday, I have posted articles on Carimin Petroleum and Hibiscus Petroleum to help readers make money. As these 2 stocks are just beginning to move upwards, I believe they will move up a few hundred percent in 1 or 2 years, like Latitude, VS and Lii Hen. Of course, a few of my critics commented that when I recommend any share, they should sell instead of buying. I am obliged to tell readers that I have accumulated quite a large amount of Carimin and Hibiscus WC and I do not need readers to buy to support their prices because the daily traded volume in more than 10 million shares for each counter. But you must remember that no share or counter can continuously go up or come down for whatever reason. After some time, it must correct as demonstrated by Hibiscus and Carimin yesterday. Both of them dropped a few sen per share. A good test is did you sell at the peak and do you dare to buy back after correction? It is not what share you bought but when you sold is more important. I wasn’t sure of my skill until I found Hibiscus and Carimin. I realise my mistake in buying too many Jaks using margin loan and ignoring my golden rule. When the price dropped, I was forced to sell. The more I sold the more the price would drop and the more I was forced to sell. Forced sell is a vicious cycle. Basically, I was wrong in ignoring the company’s huge loan for its property development business. Until the property market recovers, the company will have difficulties in servicing its huge loan. Unfortunately, there are many short-term traders who are buying Jaks because they believe it will rebound soon. They must remember, among all the criteria for share selection such as NTA, cash flow, net cash in the bank etc, the most powerful catalyst to move share price is profit growth prospect. Can the company report increasing profit for 2 consecutive quarter?